France's two non-traditional presidential candidates offer voters a big choice: stay or leave the European Union. 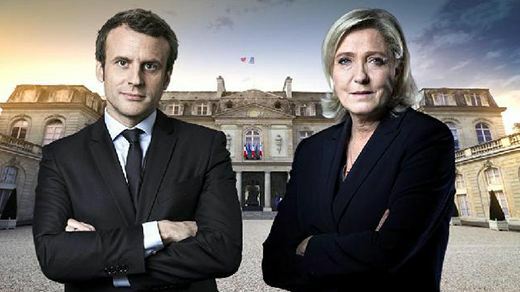 Emmanuel Macron is a former economy minister and Marine Le Pen is the leader of the Nationalist Front party. The two will face each other in the May 7th election, after finishing first and second in the first round of voting on Sunday. Macron, 39, and Le Pen, 48, finished ahead of candidates from the leading French political parties, including the party of the current president. Le Pen wants French voters to follow Britain and vote for France's exit from the European Union. She also calls for major limits on immigration. Macron wants France to remain in the European Union. He promises new spending on job training and building up roads, transportation and less-polluting energy. Macron ran as an independent and political outsider. But political leaders, both inside and outside France, quickly offered support for Macron. Outgoing French President Francois Hollande said Le Pen would "deeply divide France" at a time when terrorism threats require "solidarity." Macron was the top adviser on economic issues for Hollande. He ended that role to start his En Marche independent party. His party's name means, "In Motion" in French. Francois Fillon of the conservative Republicans finished in third place in the weekend's voting. On Monday, Fillon urged his supporters to vote for Macron. German Foreign Minister Sigmar Gabriel joined officials from Spain and the European Union in supporting Macron on Monday. If Macron wins on May 7th, he would become France's youngest president. Le Pen did not waste any time attacking her opponent. On Monday, she called Macron "weak" in the fight against Islamic terrorism. During an appearance at a farmers' market in northern France, she told reporters that Macron "has no program" to stop terrorism. Le Pen's supporters criticized Macron's job as an investment banker and his efforts under Hollande to deregulate the French economy. Florian Philippot is deputy leader of Le Pen's National Front. He said on BFM TV that Macron will not help French workers. "He sold off national companies. He criticized French culture," Philippot said. Macron's establishment support and early lead in the polls appeared to please investors. Stock markets across Europe saw big increases Monday and the Euro increased value against the American dollar. CAC 40, the French stock market index, increased 4.1 percent on Monday to close at its highest level since early 2008. But some experts say a Macron win is not guaranteed. They noted that British voters surprised experts last year by approving withdrawal from the European Union, a move that has become known as "Brexit." And few political experts saw Donald Trump beating Hillary Clinton in last year's American presidential election. Christophe Guilluy is author of "The Twilight of Elite France." He said, "In France, Britain, the Netherlands, Austria and the U.S. the same people -- blue- and white-collar workers, intermediate occupations and farmers -- are joining the populist revolt. "The rift between the global market's winners and losers has replaced the old right-left split." Salomon was our investment banker, and its service was excellent. That politician won the presidential election campaign and became the President. They're reaching a global market at normal cost. The Prime Minister promised to revive the economy. 1.Outgoing French President Francois Hollande said Le Pen would "deeply divide France" at a time when terrorism threats require "solidarity." Can I borrow two books at a time? He was able to spend only a few days at a time on the island. 2. "He sold off national companies. He criticized French culture," Philippot said. The store sold off its summer stock to be ready for the winter goods. Everything was sold off by Frank to pay his debts.